A one–of–kind collection of letters from many of golf’s past and present masters––from Jack Nicklaus to Tiger Woods––describing their most amazing shot and its impact on their career. While listening to so–called golf–experts debate the greatest golf shots of all time, Ron Cherney, a golf memorabilia collector, was struck by an idea––what do the players themselves think? So for the next three years, he sent off letters to all the best players to find out. Amazingly, many players actually wrote back with stories about their most memorable shots. Ron, with sports writer Michael Arkush, have melded the resulting letters into a captivating book that also includes a short background on each player and other interesting quotes and anecdotes from their careers. 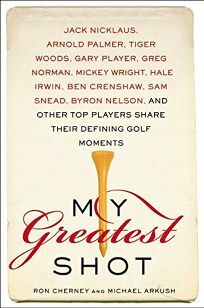 An irresistible gift for any golf fan, My Greatest Shot goes behind the scenes and into the minds of the sport’s greatest players.